A few years ago, the US Food and Drug Administration (FDA) notified physicians and medical practices of a possible contamination of their supplies of bevacizumab, a drug used in combination with chemotherapy to stop tumour growth. It turned out that several cancer patients were actually being given corn-starch instead of anticancer meds. Before the counterfeit bevacizumab arrived in the US, it travelled through Turkey, Switzerland, Denmark, the U.K. and Canada. In Singapore, four people died and seven suffered severe brain damage when their blood-sugar levels dropped heavily after intake of counterfeit drugs claiming to treat erectile dysfunction, but, as it turned out, contained a hefty dose of an active ingredient used for treating diabetes patients. For people living in the more challenged parts of the world, the problem is so severe, it’s hard to grasp. According to a recent BBC feature quoting the World Health Organization (WHO), “More than 120.000 people a year die in Africa as a result of fake anti-malarial drugs alone” and “(…)about a third of all anti-malarial drugs in sub-Saharan Africa are fake”. According to another source, falsified malaria drugs caused an estimated 122.350 deaths in African children in 2013. In addition to the most tragic consequences of all, the problem bears witness of flaws in the pharmaceutical supply system and thereby undermines the credibility of the health and pharma industry. Furthermore, it represents huge lost profits. A report from 2014 states that counterfeit medicines “cost US businesses more than $200 billion annually and account for the loss of more than 750,000 jobs”. WHO estimates the yearly cost at £36.9bn a year. As the manufacturing of drugs moves to less developed markets and ecommerce trade keeps growing, the threat from counterfeit medicine is becoming even bigger. In just a few years, the number of confiscations of fake and illegal pills has grown from 2.4 million in 2011 to 20.7 million in 2015. 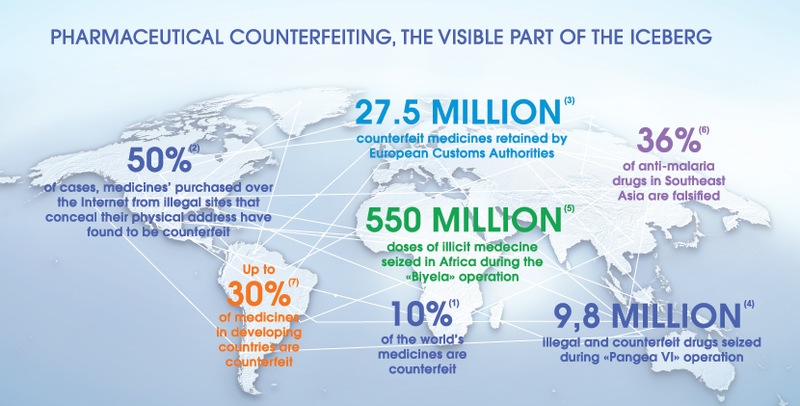 The global pharma industry has complex networks that criss-cross the globe, making it hard to fight the counterfeits. A single pill might pass through a dozen countries during its manufacturing process, which offers many opportunities for criminals to place fake drugs into the supply chain. Sabine Kopp, executive secretary at the International Medical Products Anti-Counterfeiting Task Force and manager of WHO’s anti-counterfeiting programme, has seen examples of medicine deliveries at hospitals where counterfeit medicines have been added to genuine batches of medicines: “The counterfeiters simply falsify the delivery papers by adding an extra zero to the quantity supplied, then they make up the difference by adding their own boxes to the order,” she says in a bulletin by WHO. 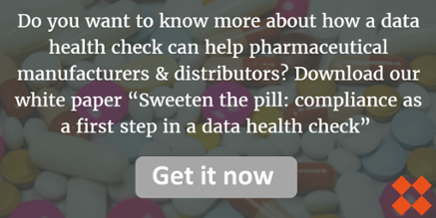 As a pharmaceutical manufacturer or distributor, the best way to fight the fraud is for you to be able to monitor your entire supply chain by tracking your products at each stage of its journey from the factory to the consumer. Furthermore you need to strictly manage labelling and develop effective protection technologies on products packaging’s so that it becomes easy for the users to identify it but expensive and difficult for the counterfeiters to reproduce it. The huge counterfeit challenge stresses the need for the industry to improve data management processes and to ensure high standards of data governance within the pharmaceutical sector. With the recent introduction of Identification of Medicinal Products (IDMP) legislation within the European Union this need is only reinforced. Without better data management, people and the pharma industry itself will be the losers.